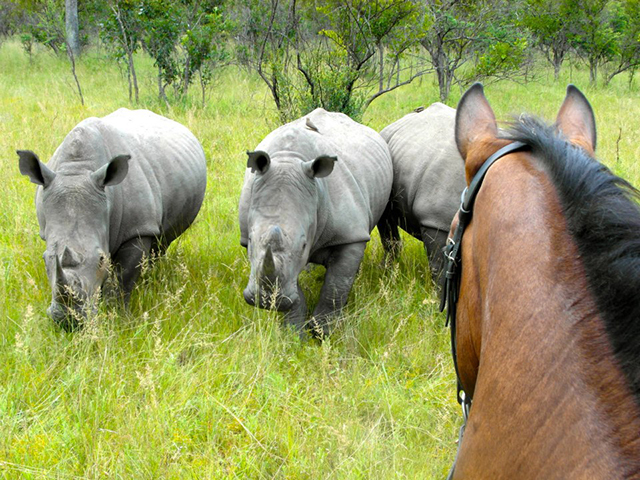 The 'Big Five' are what everyone dreams of seeing on safari, but can it be done from horseback?  Agnes Stamp reviews Wait A Little Horse Safaris. There he was. 250kg of solid feline flesh, with paws the size of dinner plates, piercing us with dark eyes. He got up slowly, and stretched, showing off his full size, and yawned displaying a fine set of rather large teeth. He was the most magnificent beast I’d ever seen. And here I was, in the saddle, only a stone’s throw away. 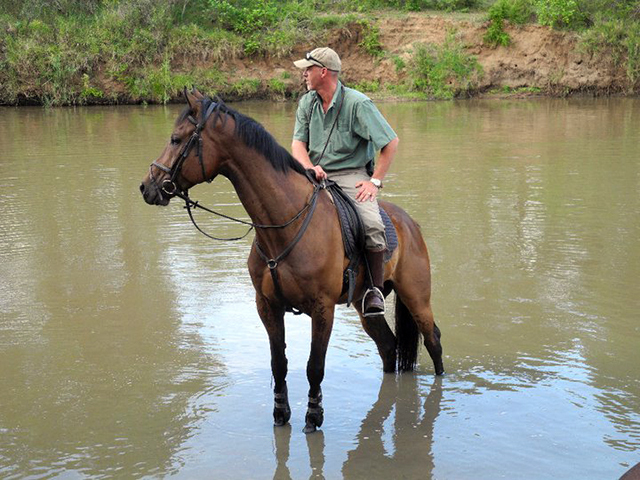 Wait A Little Horse Safaris offers experienced riders a once-in-a-lifetime opportunity to view the ‘Big Five’ from horseback. Owned by Philip and Gerti Kusseler, Wait A Little operates across 30,000 hectares of unspoilt bushveld close to South Africa’s Kruger National Park and overlooked by the beautiful Drakensberg Mountains. Much of the region is covered in dense bush and thorn scrub however, riverine gullies offer alternative terrain, with huge fig and jackalberry trees and lush, exotic vegetation along the banks of the rivers. Rocky ‘kopjes’ – small hills that are very typical of Africa – are dotted across the plains and provide wonderful viewpoints. Sandy tracks, old fence lines and in the dry season, sandy riverbeds, all provide good going, ideal for fast canters. It is easy to see why Philip and Gerti emigrated here from Germany to set up camp in such a captivating part of the world. For many, it is hard to imagine embarking on a riding holiday and mounting something that is as good, or – dare I say it – better than your usual ride at home. The thought of paying for a decrepit old trail horse, completely deaf to yet another rider’s legs is enough to put even the most enthusiastic Thelwellian rider off. Not the case at Wait A Little. 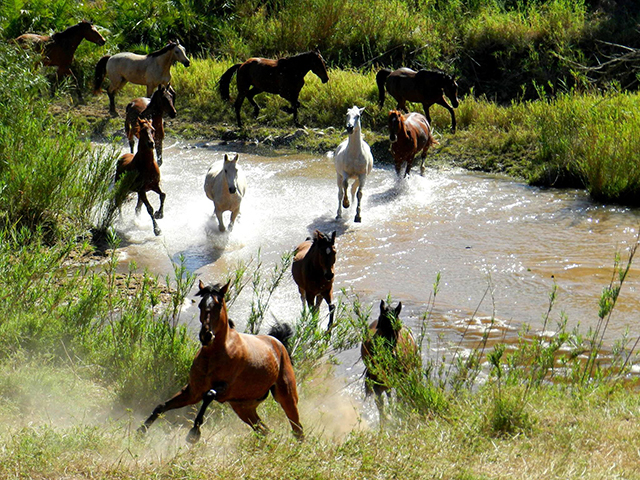 Over 30 horses live on the ranch, ranging from 14.3hh to 17hh. They include Boerperds, a tough and sure-footed South African breed as well as Warmbloods, Thoroughbreds and a variety of crossbreeds. Gerti, an accomplished dressage rider, schools the horses herself, ensuring they are fit, supple, well mannered and incredibly responsive to ride. A walk up to the airy American-style barn also confirms stable management is second to none. It’s easy to see why Wait A Little is a safari favourite amongst the equestrian elite; Lucinda Green, Ingrid Klimke and Clayton and Lucinda Fredericks are all on the 4* clientele roll call. Time in the saddle varies from 4 to 7 hours a day, depending on the safari. Most of the rides are led by Philip, Wait A Little’s answer to Indiana Jones. His enthusiasm for tracking is infectious and he displays a deep knowledge and understanding of the wildlife and environment, with a tale to tell about every animal that crosses our path. From horseback, we were lucky enough to see lion, elephant, rhino, zebra, buffalo and got rather too close for my liking to a large crocodile guarding her nest. A real thrill was galloping alongside giraffe, as was catching a fleeting glimpse of a leopard – the ‘Big Five’ Holy Grail. On the odd occasion we met a safari vehicle, I couldn’t help but pity those onboard – the game drives have to stick to tracks and paths but on horseback we were free to weave and wind our way wherever we pleased, picking up the pace with plenty of sporty canters and long gallops when the terrain allowed. Accommodation is in luxury double-bedded canvas safari tents on platforms individually built and furnished in the old safari style. Each tent features a delightful private outdoor bathroom; ensuring even daily ablutions are yet another opportunity to enjoy the scenery. From the veranda decking you’ll enjoy a magnificent view over the Makhutswe River and if you’re lucky spot wildlife that has ventured close to the camp. One afternoon we were transfixed by the sight of a female cheetah and her two cubs on a fresh kill, and the following morning, the soft crackling of dry branches alerted us to a couple elephants ambling through. On our final morning, a handsome Friesian gelding called Walker carried me into our last game sightings. 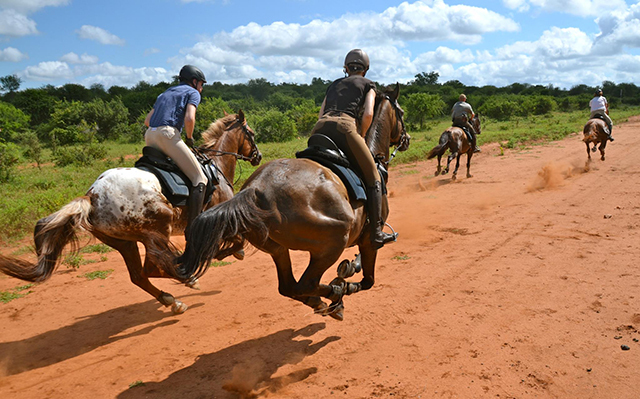 As we pushed on into another exhilarating canter, I caught sight of our silhouette against the red African soil – his hooves pounding the dust and both our ponytails streaming out behind us. Wait A Little had certainly exceeded all my expectations of an old-fashioned adventure holiday. Freedom is indeed, riding a horse.